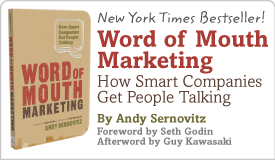 Save the Date: Word of Mouth Crash Course, May 10, Austin | Andy Sernovitz | Damn, I Wish I'd Thought of That! Big news: We’re bringing back the world’s greatest word of mouth marketing conference: The Word of Mouth Crash Course in Austin on May 10. Important: The first 100 registrants will get 50 copies of new revised edition of my book, Word of Mouth Marketing, which is being released the day before. Use them to train your team, educate clients, or pull in prospects. This is worth $650.